Who doesn’t want a nice, luxurious, soft carpet in their home? If you ask nine out of ten people, they will agree that the softer the carpet, the better. This is especially true in rooms designed for comfort, like a bedroom or living room. If you are a lucky person and have a soft carpet, then you know how important it is to keep it clean. Today, we’ll let you know the top five best vacuums for soft carpet. If you are new to the world of vacuum cleaning soft carpet, you will not want to skip this article. Instead, read on to learn more about soft carpet and how to keep it clean and looking its best. Do I have soft carpet? First of all, what is soft carpet? The definition of soft carpet is easy, it is any carpet that feels soft underfoot. Softness can be achieved in carpet in many different ways, but the three most common are the denier, the material, and the style of carpet. Denier may be a word you’ve not heard before. It refers to the thickness of the strands of fabric that make up the carpet. The denier in a carpet can be high or low. Buying a carpet with a high denier, over 24, means that your strands will be quite thick, which makes the carpet hold onto warmth. If you buy a low denier, 10-12, carpet, the strands are much thinner. This will not create much warmth, but it will make for an extremely soft carpet. The material of the carpet will also determine how soft it feels, as some are naturally softer than others. Wool, for example, is an extremely soft material. On the other hand, some nylon carpets are more scratchy than soft. The best way to determine if a carpet material will have the softness that you want is to feel it. Finally, the style of the carpet—how the fiber is put together and the density of the final product—will greatly determine how soft it feels. Looped carpets are not usually as soft as cut pile carpets. Plus, carpets with tight twists like frieze are generally not as soft as other styles. The decision of whether or not to use a soft carpet material depends on where you plan on putting the carpet and how often you plan on using it. As we discuss below, soft carpet has some special cleaning concerns, so it is better to use it sparingly in rooms where you want a luxurious feel but don’t plan on using the carpet much. When you are shopping for carpet, know that there is a difference between soft and plush carpets. The soft label on a carpet applies to its feel. It can be made of many different materials and have a variety of piles. When you hear the term plush used to describe a carpet, it is referring to the density and length of the carpet fibers. Plush carpets are generally cut to a uniform length, which is on the long side. They are not as dense as velvet carpets but are still denser than the run-of-the-mill carpets you might see in a store. Keep in mind that a plush carpet can be either soft or not, and a soft carpet can be plush or not. This means that you will need to pay attention to both aspects when you’re picking out your own carpet. Perhaps you purchased a home with carpet already installed. You may be wondering if you have soft or ultra soft carpet. The best way to figure this out is to feel the carpet. If the carpet feels soft to the touch, it is probably a soft style of carpet. If it feels coarse or scratchy, then it is not a soft carpet. If you are lucky enough to have a record of the names and brands of your carpets, then researching the level of softness should be easy. Most manufacturers will indicate how soft a specific style of carpet is, so you can consult their online catalogues. If neither of the above two options works, one final thing to try is to ask an expert. If you are shopping for new carpet, this will be easy. Just ask your sales person what the softness level of the carpet you are considering. Soft carpet has a lot of advantages. It feels great underfoot and can make your home feel luxurious. However, it does come with its own special cleaning considerations. Most importantly, you will likely have to purchase a dedicated soft carpet vacuum cleaner. Soft carpet is hard to vacuum and clean because the fibers are much thinner than normal carpet. The thinner the fiver, the softer the carpet. But, this makes cleaning those fibers especially hard. Also, soft carpet piles have more fibers in them to help keep them soft. This means a normal vacuum may have a hard time actually moving on the carpet surface. And, as we all know; if a carpet can’t move, it can’t clean. Finally, when you have a dense, soft carpet, it is more likely that dirt and dust can get trapped between the fibers. They can hold the dirt in tightly, which makes them that much harder to clean. This is especially true because if you don’t have a soft carpet vacuum cleaner, you may not have exactly the correct amount of suction to remove the dirt without damaging the carpet fibers. To recap, there are a few different pros and cons to consider when considering installing soft carpet. Feels great and can provide warmth. You can walk on it barefoot. It makes a room more luxurious and cozy. They come in a variety of sizes, materials, and styles. It has its own cleaning considerations and may necessitate you buying a specific vacuum for soft carpet. They get dirty easily and can be hard to keep clean. They are not as durable. There are some important features you should look for in a vacuum for soft carpet, so that you know you are getting the most for your money. Today, you can find many vacuums that allow the user to raise or lower the deck height. This feature is especially important in vacuums for soft carpet because the height needs to be just right to clean properly. If the vacuum is too low to your soft carpet, it can make it hard to push the vacuum. Plus, this situation can cause damage to your soft carpet. However, if the vacuum is too high, then it won’t reach the soft carpet at all and nothing will get clean. In order to be safe, make sure that your soft carpet vacuum cleaner has multiple height settings. We recommend at least three, so that you have the chance to dial the height in correctly. Obviously, the most important part of your vacuum for soft carpet will be the cleaning head. This is that part of the vacuum that actually applies suction to your carpet. Some vacuums only have a beater bar that you push along the ground. However, many vacuums come with an extendable wand that has different cleaning heads and can fit in hard-to-reach places. Because of the importance of this part of your vacuum, you will want to pay close attention to it on every product you look at. The top soft carpet vacuum cleaners have a wand as well as a suction head. They also allow you to control the suction level. And, many even make it possible for you to turn off the beater bar, which is very important with soft carpet. The more control you have over these elements of these elements, the better. Paying attention to a vacuum’s filtration system is important for all types of vacuums, and in this area, vacuums for soft carpet are no different. The best type of filtration system for any vacuum is a HEPA—high efficiency particulate air—filter. These filters have to meet certain standards—specifically, they have to be able to remove 99.97% of particles over .3 micrometers. What this means is that a vacuum with a HEPA filter is proven to remove almost all unwanted dust and dirt particles. One other type of filtration system you may find is a cyclone pre-separator. Dyson vacuums made this system popular. Vacuums with this type of filtration do not need a filter at all but use an air vortex to separate out dust and dirt particles. Different manufacturers include a variety of extras with the purchase of a vacuum. In general, the best accessories with a soft carpet vacuum cleaner are a dusting brush, upholstery tool, and crevice nozzle. These three extras will help you get into all the nooks and crannies of your soft carpet and provide it the best cleaning of its life. If you have pets in your home, you will want to choose a soft carpet vacuum cleaner that is pet friendly. While pet friendly vacuum cleaners can be found for any floor type, it will be even more important for your soft carpet, since pet hair can get stuck in the fibers. You need a vacuum that has enough suction to remove the pet hair without hurting your soft carpet. Often manufacturers will include a pet-specific tool with their vacuum for this purpose. The heavier your vacuum, the easier it will be for it to get stuck in your soft carpet. Vacuums for soft carpet should be on the lighter side. This will enable them to move more smoothly on the fibers. Large, wide-set wheels help to displace some of your vacuum’s weight. If you choose a vacuum for soft carpet that is one the heavier side, look for a model that has wide and large wheels. The Soniclean soft carpet vacuum is our top pick for soft carpet vacuum cleaners. It is an upright model with a HEPA filter, so you know that it will clean effectively. It also is the only vacuum on our list that uses sound technology to deep clean soft carpet fibers. It’s 200 sonic vibrations per second will shake loose all of the hard-to-vacuum dirt particles in your soft carpet. Soniclean’s soft carpet vacuum cleaner comes with nylon brush roll bristles, which are gentle on your soft carpet. It is also super light-weight and comes with jam protection, so that it will have increased durability. This is a great choice for anyone looking to effectively vacuum their soft carpet. SharkNinja has designed their Shark Rocket DuoClean Ultra-Light Corded Bagless Vacuum cleaner specifically for soft carpet. It is a stick design, which reduces its weight significantly. It also converts into a 4.6 lb. hand vacuum for soft carpet. Plus, it includes a soft brushroll and bristle brush. These tools will work great for any type of carpet and ensure that the Shark Rocket does not damage even the softest of floors. This vacuum for soft carpet is pet friendly and includes a pet multi-tool with your purchase. You will also receive a duster crevice tool, wall mount, and storage hook, so, essentially, everything you need to give your soft carpet a good deep cleaning. Miele’s Complete C3 vacuum for soft carpet is our first canister vacuum on today’s list. Canister vacuums are good because they allow you to vacuum your soft carpet with minimal movement from the vacuum, the long hose usually does all the work. Plus, this style of vacuum is very flexible and can reach almost any place. Miele’s soft carpet vacuum cleaner has adjustable suction, so you will not have to worry about damaging your delicate carpet. It also has a 5-stage height adjustment system, wheel that swivel 360-degrees, and a HEPA air filter. Finally, the Complete C3 comes with the SoftCarpet Electrobrush, which provides the best cleaning for soft carpets. Kenmore is a well-known name in the home appliance industry. So, it makes sense that they would make a great soft carpet vacuum cleaner. Their Elite 81714 Pet Friendly Ultra Plush Bagged Canister Vacuum includes a two-motor system for more sucking power. It also has HEPA filtration and is easy to move on any floor. In terms of cleaning soft carpet, the canister design and long hose mean that you shouldn’t need to push the vacuum on much of your soft carpet as you clean it. Also, your purchase of the vacuum includes four cleaning tools, which make vacuuming your soft carpet correctly a breeze. Another canister vacuum, the Electrolux EL-4335B Corded Ultra Flex Canister Vacuum is perfect for any soft carpet. It has an on/off brush roll switch, so you can turn the beater bar off when vacuum your delicate soft carpet. Also, the EL-4335B comes with a 3-level height adjustment system. If you need any more proof that Electrolux’s vacuum for soft carpet is the one for you, here are a few more features. Its hose reaches 33-feet and it has a 12-amp motion control system. The brushroll comes with self-cleaning technology, which means less upkeep for you. In addition to buying the perfect vacuum for soft carpet, there are some other things you can do to keep your precious carpet clean. Here are a few tips and tricks for keeping your soft carpet immaculate. Vacuum slowly. If you vacuum too quickly, you could pass over a large percentage of the dirt in your carpet. Make sure that you are moving the vacuum slowly and covering the entire surface of your soft carpet. Vacuum in both directions. Always vacuum your carpet in both directions. This allows for greater dirt pickup and will help to fluff those soft carpet fibers up. Use the vacuum attachments. When you are vacuuming soft carpet, the attachments are your friend. They can help you reach places that your full vacuum cannot go. Also, using the crevice tool on corners and the dusting brush on ultra-soft places can make the vacuuming process go smoother and quicker. Vacuum often. The more often you vacuum the cleaner your carpet will be. This does not mean that you have to vacuum daily—unless you want to—but once or twice a week will help. When you vacuum more frequently, the dirt does not have a chance to build up in the fibers. Plus, your carpet will just look better. You spent a long time looking for your soft carpet vacuum cleaner. So, you should do everything in your power to keep it in good working order. Follow these steps to ensure your vacuum for soft carpet stays with you for a long time. Remove items too large to be vacuumed before you begin. Large items can damage your vacuum by getting caught in the beater bar or the attachments. Pick them up before you begin, and you will not have to worry about them messing up your vacuuming experience. Change the filter and bag—or empty the container if bagless—often. Most modern vacuums have a line on the bag or container that will tell you when to empty it. Make sure to follow this advice and the time limit for the filter—if your vacuum has one—and your vacuum will always clean consistently. Clean the beater bar regularly. Hair and fuzz can get caught and tangled in the beater bar. You will want to clean it out—this sometimes requires careful cutting—to keep your vacuum for soft carpet in its best shape. Provide maintenance the minute you discover a problem. If you think that there might be a problem with your vacuum, you should have it checked out as soon as possible. Vacuum when there is a problem with your machine will only make things worse and could cause irreparable damage. Over the last few years soft and ultra-soft carpet have become more popular in American homes. This type of carpet has a lot of benefits, not the least of which is its amazingly soft texture. However, it comes with specific cleaning requirements. 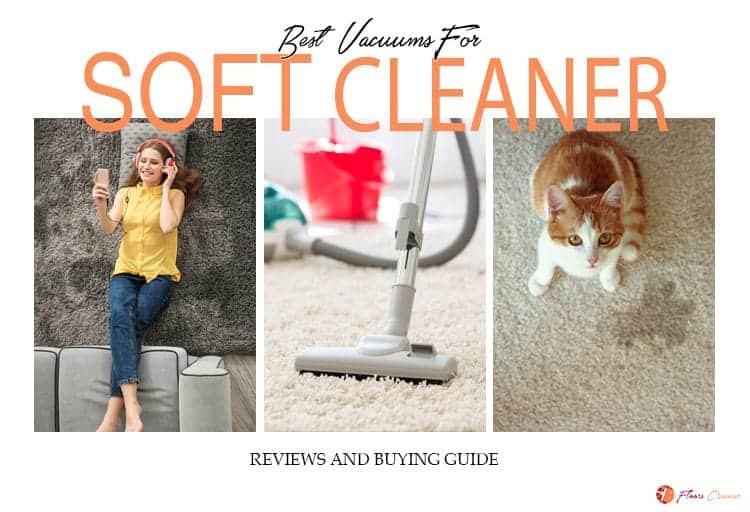 If you want to keep your soft carpet clean, you need to check out one of our picks for the best vacuum for soft carpet. Any of the products mentioned in today’s article will work perfectly on your soft carpet. Plus, if you also follow the tips and tricks mentioned in our buyer’s guide, you will never have to worry about keeping your soft carpet clean ever again.